Bubbling with joy and ’60s-era music and dance, “Hairspray” is the Tony Award-winning hit Broadway musical piled bouffant high with laughter, romance and deliriously tuneful songs. Tracy Turnblad is a teen whose life revolves around dancing on the Corny Collins TV show. Who knew that a teenybopper TV show could be a catalyst for integration? You can’t stop the beat, and truth be told, you won’t want to once the all-singing and dancing cast takes the stage. “Hairspray” performs Nov. 28-Jan. 4 in the Archbold Theatre at the Syracuse Stage/Drama Complex, 820 E. Genesee St. Discounted preview performances are Nov. 28-Dec. 4. The Opening Night performance is Friday, Dec. 5, at 8 p.m.
Tickets and info are available at http://www.syracusestage.org, by phone at 315-443-3275 and in person at the Syracuse Stage Box Office, Monday-Friday, 10 a.m.-5 p.m. Ticket discounts are available for groups of 10 or more at 315-443-9844. Discounts are also available for seniors, students and U.S. military personnel and veterans. Sign interpretation, open captioning and audio description services are available for select performances. Family guide: fun for all members of the family, some mildly suggestive dialogue. The Broadway production of “Hairspray” won eight Tony Awards in 2003, including Best Musical. Incorporating ’60s-style dance music and rhythm and blues, popular songs from “Hairspray” include “You Can’t Stop the Beat,” “I Know Where I’ve Been,” “I Can Hear the Bells,” “Big, Blonde and Beautiful,” “Good Morning Baltimore,” “Run and Tell That,” “It Takes Two” and “Welcome to the ’60s,” among others. Composer/lyricist Marc Shaiman and lyricist Scott Wittman won the Tony Award for Best Original Score and a Grammy Award for Best Musical Show Album. “There are so many things I like about “Hairspray.” The music is fabulous, and the choreography by David Wanstreet (“White Christmas,” Syracuse Stage) is going to be out of this world,” says Fennelly. 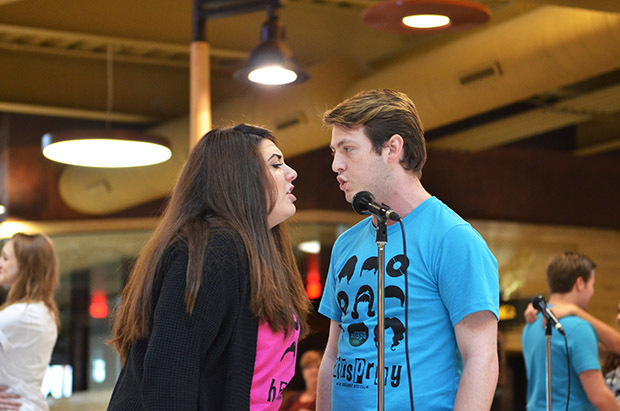 “Hairspray” is a co-production with Syracuse University’s Department of Drama in the College of Visual and Performing Arts. The 29-member cast includes professional Broadway actors, SU Drama faculty members, SU Drama alumni and current SU Drama students.